Exeter and Plymouth Gazette - Tuesday 8 April, 1924. Theatre Royal, Exeter. "Mr Haddon Mason makes manly Dan Davis, while the scheming Schenkmann is capably portrayed by Mr Charles Mortimer." 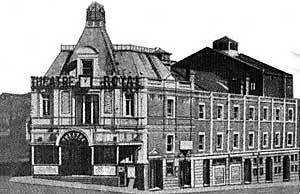 Charles Mortimer played the part of Schenkmann in "Partners Again", at the Theatre Royal, Exeter, in April, 1924. Article from the Devon and Exeter Gazette of 8 April, 1924. From the Folkestone, Hythe, Sandgate and Cheriton Herald, 5 April, 1924. "Partner's Again" had played the Garrick Theatre, London, from 28 February to 14 August, 1923, although it is not known if Charles Mortimer was in the cast.